Isaiah Thomas‘ comeback has hit another dead end, writes Nick Kosmider of The Athletic. The former All-Star will have his playing time sharply reduced as coach Michael Malone trims the Nuggets‘ rotation for the rest of the season. Thomas has appeared in just nine games since returning last month after his latest hip surgery. He is averaging 8.6 PPG, but is shooting just 37.3% from the field and 27.3% from 3-point range. Malone broke the news to Thomas before Tuesday’s game. Thomas will be a free agent again this summer after signing a one-year, veteran’s minimum deal with Denver last summer. The Nuggets knew he wouldn’t be available right away because of the surgery, but hoped he could develop into a backup point guard in time for the postseason. However, Monte Morris seized that slot while Thomas was sidelined, leaving the veteran guard with an uncertain future once again. Thomas appeared on the verge of a max contract after a pair of All-Star seasons with the Celtics, but he was sent to Cleveland in the Kyrie Irving trade in 2017 and has never been able to overcome a lingering problem with his hip. Thomas, who turned 30 last month, has now had brief, unsuccessful stays with the Cavaliers, Lakers and Nuggets, playing a total of 41 games since leaving Boston. FEBRUARY 13: Thomas will return to the court and make his Nuggets debut on Wednesday, Wojnarowski confirms (via Twitter). FEBRUARY 12: Isaiah Thomas could make his debut for the Nuggets as soon as Wednesday against Kings, Adrian Wojnarowski of ESPN.com reports. Thomas, who signed a one-year deal with Denver during the offseason, underwent a hip procedure last year and was only able to suit up for a total of 17 games last season. 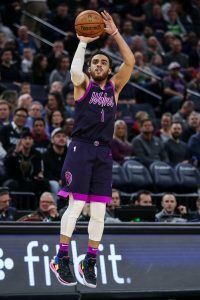 The point guard participated in five-on-five drills today and a decision on his status for the Kings’ game is expected to be determined early on Wednesday. Denver sits just 2.5 games behind the Warriors for the lead in the Western Conference. It’s unclear what kind of role Thomas is expected to play for the remainder of the season, but the club has enough depth in the backcourt to bring him along slowly.